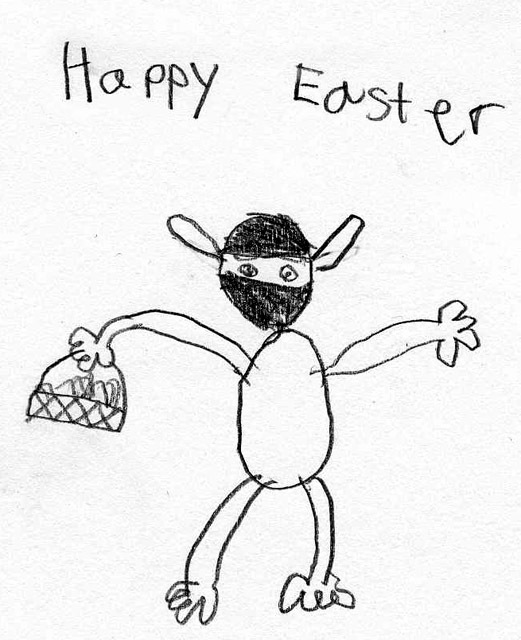 Pictured above, “Ninja-Monkey-Easter-Bunny”, by Eamon . 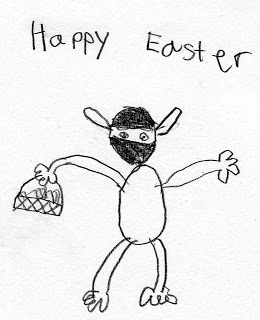 For more Easter silliness, here is a poem I wrote about our family. It would actually be more apt to describe the poem as the climax to the current topic of our “Word of the Week” series, which is a ridiculous imagined circus put on by family members. What is “Word of the Week”? Well, since you are a captive audience, I’ll tell you… As a home schooling mom, I’ve noticed that, due to texting and emails replacing much traditional writing, our vocabulary is severely underutilized. We expect kids to know there words for SATs and other standardized tests, but pay them no attention in our everyday lives. “Word of the Week” is my feeble attempt to make words more interesting to my children. It is easy and it works! I subscribe to a “word of the day” service that provides me with an interesting vocabulary word each day, complete with a definition and example sentence. I use Merriam-Webster for this, but there are many different options out there. Each week I pick an particularly interesting word and modify the example sentence so that the subject matter involves my kids and the things that interest them. (The poem was just an extra addition.) I email them the result. These serial emails obviously have none of the markings of good literature and all the corniness of a soap opera, but I digress. Before I post the poem, let me give you some background. Setting: An imaginary town that we all live in. True-self – my brilliant brother and computer programmer extraordinaire for Epic Games; he is a big fan of this saga and was really disappointed when it went from “Word of the Day” to “Word of the Week” – sorry J! He will appreciate this post. True-self – Jason’s wife and my sister-in-law; a great athlete and artist who designs cards for Recycled Paper; in real life she took Caitrin to trapeze school one afternoon! True-self – Caitrin’s and Eamon’s almost one-year-old cousin who enjoys waving, attempting to walk, and playing with his dog’s waterbowl ; this kid has great hair! Reprobate Harley tootles around in her coupe. Dude and Jason follow her in a big loop-de-loop. Pops scooters down the aisle balancing donuts on his head. Bailey and Lolly supine and “play dead”. No one would guess things have been haywire. Pops pops donuts into his mouth and breaths out fire. And the fugleman show off their “guns”. Ollie blasts out of the cannon – he’s our live petard! Eamon catches him – yes, that really was hard. The brougham swerves through – it really is fast. The knaves rush out – they are autonomous at last! Our Eamon rounds them all up with his trusty lasso. Martinet Cait promulgates their Miranda rights. 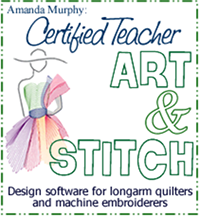 His flailing arms are waving, his hair – it doth please. While Pops marches the miscreants away. Mom’s costumes transmogrify our stars – that we must confess. Eamon’s Panglossian announcements enhanced the effects . Our troupers retire to the Lounge to CHILL-AX!